The latest from TAG is this Carrera, with a two-counter automatic chronograph movement caliber TAG 17 (base ETA 2894) that measures 39mm. 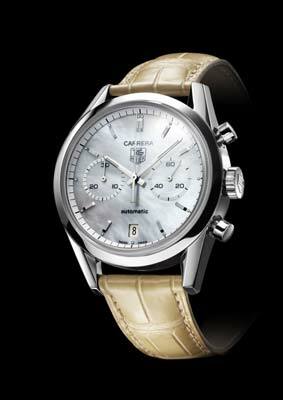 It features a sapphire crystal and the dial can be had with up to 78 VVS Top Wesselton (0.78 carats) diamonds. The dial is in Nacre (a mother-of-pearl variant). The chronograph features a seconds counter at 3 o’clock, a minutes counter at 9 o’clock and date window at 6 o’clock. The hands are covered in Superluminova.